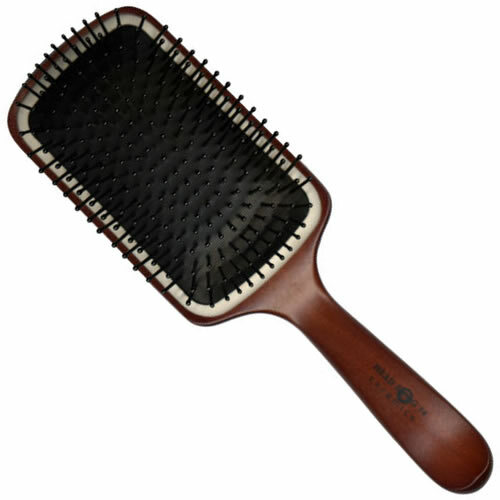 The Head Jog 74 Ceramic Wooden Paddle Brush uses ceramic technology to create a smooth polished effect with added natural shine. Its design will help resist static build up and also allows for heat to be distributed quickly for fast and effective styling and drying. It looks great, too, featuring a natural wooden handle, which is ergonomically designed for easy grip and maximum control. £6.54 (inc. VAT) Why no VAT? We're a trade wholesaler and quote our prices without VAT to help our VAT-registered customers understand the true cost of a purchase. Stylish stand with a rubber insert that's designed to grip and hold many different types of hair brush securely in place. It measures 21 cm x 5 cm x 3.5 cm. Best brush I've ever used. I got the mixture of boar bristle and poymide pins gets through any hair but the boar bristle really grips for putting hair up. A great brush for detangling long hair smoothing giving the hair a lovely finish. I use it in the salon for a year now looks good as new. Love it!